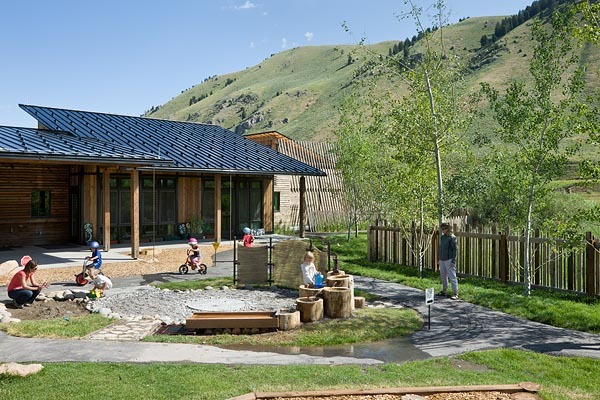 "The Ranch" is a LEED Gold certified project that comprises the first of a multi-phase early education program planned for Teton County, Wyoming. 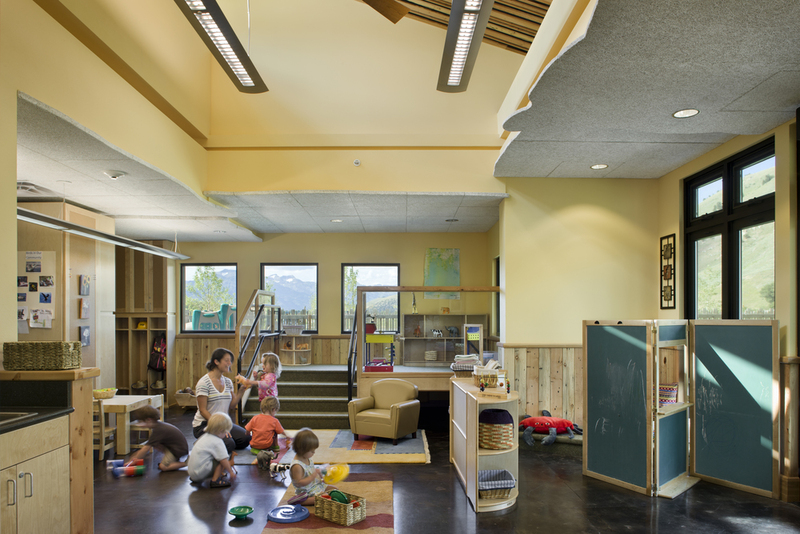 D. W. Arthur Associates, working in collaboration with local firm Ward Blake Architects, developed a comprehensive master plan for Teton County for the consolidation and expansion of its early education programs. 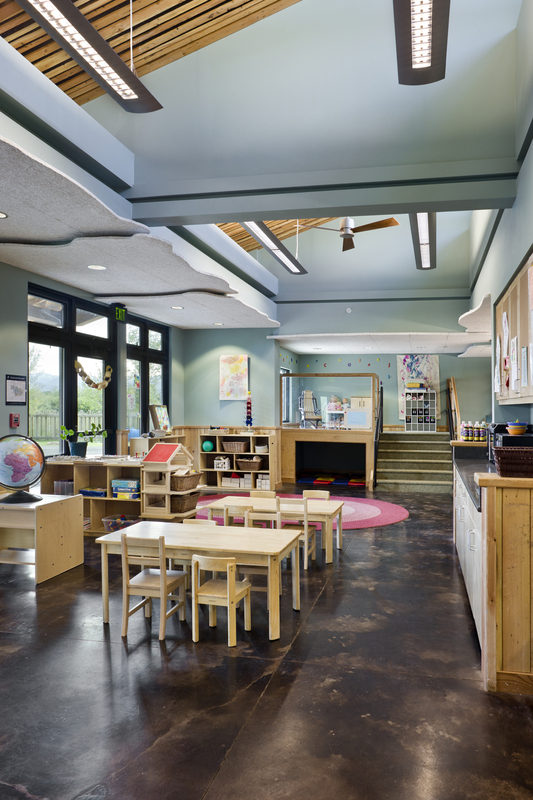 The building design integrates a variety of programs, including special needs and Head Start, with highly flexible but age-specific room clusters. Located on a magnificent site with immeasurable natural assets and significant development constraints, this design was developed to sit lightly in the landscape. As the master plan calls for an addition twice the size of this original building, a design was developed to minimize the overall footprint by including a second story. Careful consideration was given to this unconventional (for the child care building type) arrangement; ultimately the caregivers embraced the idea of developing the roof surface of the first phase building as a playground serving the abutting second story. The site sits in the geological formation known as Jackson Hole, part of the greater Yellowstone caldera. Rimmed with stunning mountain ranges, mostly notably the iconic Tetons, this 10 acre site includes a tributary of the Snake River, with adjacent hot pools, grasslands, and a full range of wildlife indigenous to this biome. 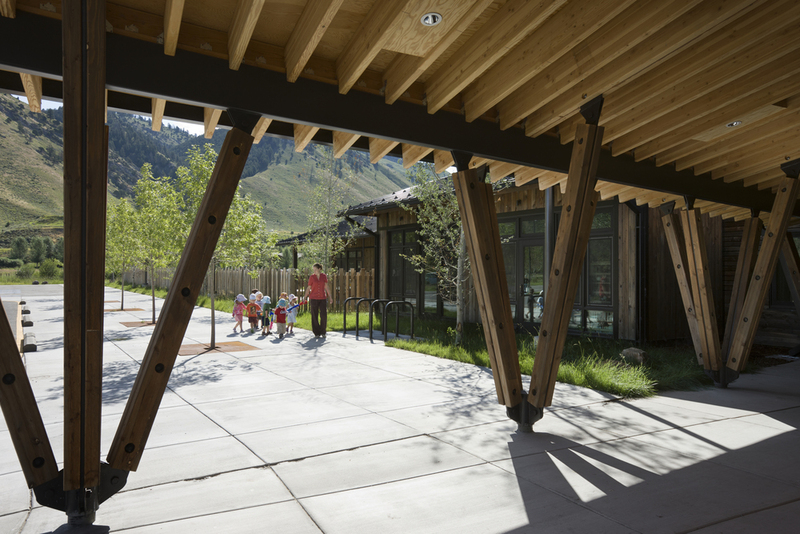 The siting strategy for the building addressed minimizing impact to this natural setting while maximizing views (and field trip opportunities) for young children. The building was designed with warm, flowing interior spaces, deep porches that ease transitions from inside to out, and deeply sustainable systems such as geothermal radiant heating and cooling, operable clerestory windows for natural ventilation, and reclaimed exterior wood siding. Local vernacular ranch structures helped inform an architectural language that is contextual but unique. “Beaverslides,” dotting the ranch lands of the western U.S., are devices made of wooden posts traditionally used to dry hay. The visual texture of the beaverslide’s wooden components recurs in the wood siding and fences surrounding the playgrounds. The playgrounds are designed to extend the children’s realm into the exceptional natural environment surrounding the building. Much of the “equipment” is natural or handmade, and chaperoned field trips are made into the natural surroundings to observe animal tracks, trout “redds” and other phenomena. The project achieved LEED Gold certification and was selected as an award finalist in the “schools” category at the World Architecture Festival held in Singapore in 2012. It was also recognized with a design award from the Boston Society of Architects in 2013.